Many users like to start explorer in drive view to directly access their data instead of the document folders. This tweak will show you how to modify the Windows Explorer shortcuts to launch directly in drive view. Click on the Start Button and type in Windows Explorer. Right click on the shortcut when it appears in the search results and select Properties. 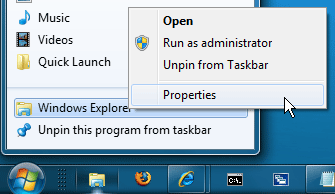 Right click on the Windows Explorer TaskBar icon. Then Right click on the Windows Explorer shortcut in the Jump List and select Properties.